As Arctic ice retreats, scientists have access to fossilized moss that can reveal clues about the region's climate history during the Halocene. All photos: Jason Briner. Associate Professor, Jason Briner (State University of New York at Buffalo), and Gifford Miller, Fellow and Associate Director of University of Colorado’s Institute of Arctic and Alpine Research, are analyzing fossilized Arctic moss that has been buried under ice for thousands of years to garner clues about the region's climate history during the Holocene. Moss that has previously been buried is now surfacing as ice caps retreat. The scientists' research, which is supported by the National Science Foundation, takes them to the small ice caps ringing Baffin Bay that are now exposed each summer as they shrink in northeastern Canada and West Greenland. The team will head back into the field August, 2014, when Miller will return to Baffin Island, Canada. At the same time, Briner will travel to the Sukkertoppen ice cap region north of Nuuk, Greenland, along with two SUNY Buffalo graduate students and PolarTREC teacher, Tina Ciaramentaro, . That information could help inform current climate models. The vegetation in the landscape could deliver critical and relevant information that can inform current climate models. The methodology of using fossilized moss as a proxy for glaciations was pioneered on Baffin Island in the 1960’s when a group working there found exposed tundra at the edge of a receding ice cap. The team took a sample home and derived the moss’ age using the radiocarbon dating technique, which uses the natural radioactive decay of carbon to estimate the age of organic material. The method wasn’t used much until the middle 2000s when Miller had a light bulb moment while lecturing to a freshman class. 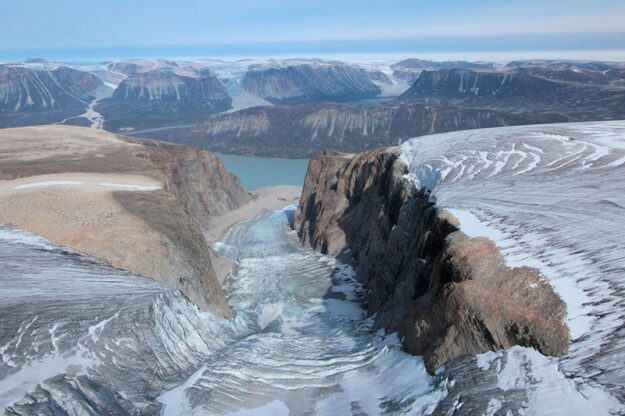 In 2005 Briner and Miller got the go-ahead to perform their own study on Baffin Island in an attempt to replicate the initial study’s results. One of their first stops was to visit the ice cap from the initial study, but the ice cap was gone, melted, and so was the fossilized moss. New plants had grown in their place. “Then we visited many ice caps in that region and sampled dozens and dozens of moss samples. Much of our new results did confirm the earlier finding, and then we've taken it to another level, I'd say. We are now expanding that first study to west Greenland to get an understanding of the broader spatial complexity of ice cap history across the north Atlantic sector of the Arctic,” Briner says. The glamorous accommodations of scientists in the field. In 2010, Briner and Miller dated two samples collected during a pilot study at Disko Island, Greenland. In 2013 they returned to expand the Disko Island study to Uummannaq fjord. 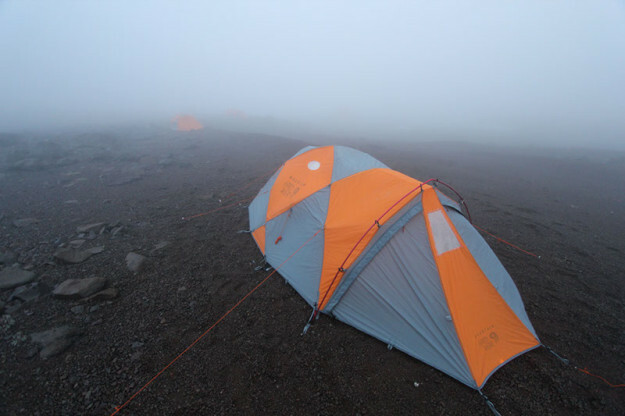 This year the team will establish remote camps and hike to sampling sites each day. Briner and Miller collect palm-sized clumps of rooted moss, which are bagged and shipped home. Back in the SUNY Buffalo lab, the moss is freeze-dried to remove moisture then rinsed with clean water or placed in a gentle sonicating bath to shake loose any clay. One strand of clean moss is placed in a glass vial and sent to the Woods Hole Oceanographic Institution’s radiocarbon lab for analysis. The remaining sample is archived at SUNY Buffalo for use by other scientists. Briner says the method is still evolving as they, and other teams, learn more about what information they can glean from radiocarbon dating moss. The vegetation study will be complemented by geochemical studies of rocks collected near ice cap margins. Beryllium and Carbon isotopes that naturally occur in the rocks also act as clocks that tell the team when and where the ice caps were present or absent in the past.